on Friday, 23. November 2018 at 26 Hofmeyrstr. Christmas time is also a celebration of light. 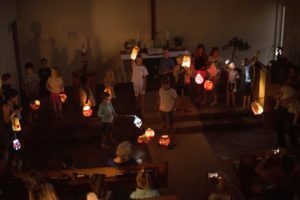 The story smith lights her silhouette lanterns and enchants with an endless supply of tales and stories that are woven around the theme of Christmas. Everything gathering around the crib has a story that fits like a puzzle together: the golden crown, angels, flying carpets, the unpredictable log of wood, half-a-prince and the little shepherd…. Stories will be told in German and Afrikaans. After the show we will go on a lantern walk.